This weekend I enjoyed my first Air and Water Show in downtown Chicago. Yes, I’ve lived almost 30 years in the suburbs of Chicago and this was my first opportunity to see the performance. On the other hand, Matt had seen the show three times before. Naturally he gave me a play-by-play of what I could expect. When we were driving down I-55 into the city, he pulled up different YouTube videos and Wikipedia snippets. Don’t worry, he was designated navigator and not driver for this particular reason. Our picture perfect spot for viewing was a rooftop in the south loop, courtesy of my boss. He and his wife hold an annual viewing party for the Air and Water Show on their rooftop deck. They provided snacks, beverages and chairs. All we had to do was show up, meet some new people, grab a chair and or beer and enjoy the show. Watching the U.S. Navy Blue Angels was amazing. Sometimes you heard them before you saw them. Your eyes were constantly scanning the skies waiting for the aircrafts to throttle out of the clouds. Our southern location provided many breathtaking turns and formation set-ups literally right above us. I was in complete awe at how fast and seamless the pilots flew. One of our friends mentioned that the pilots fly within 18 inches of each other…18 inches! Combine that with the backdrop of the Chicago skyline and Lake Michigan and of course you’re going to be in awe. My only regret from the day was not putting on enough sunscreen. I know better for next year and most importantly, so does Matt. Sorry for missing last week readers, but I was off the grid. Yes, there are still places where people choose not to have internet access. 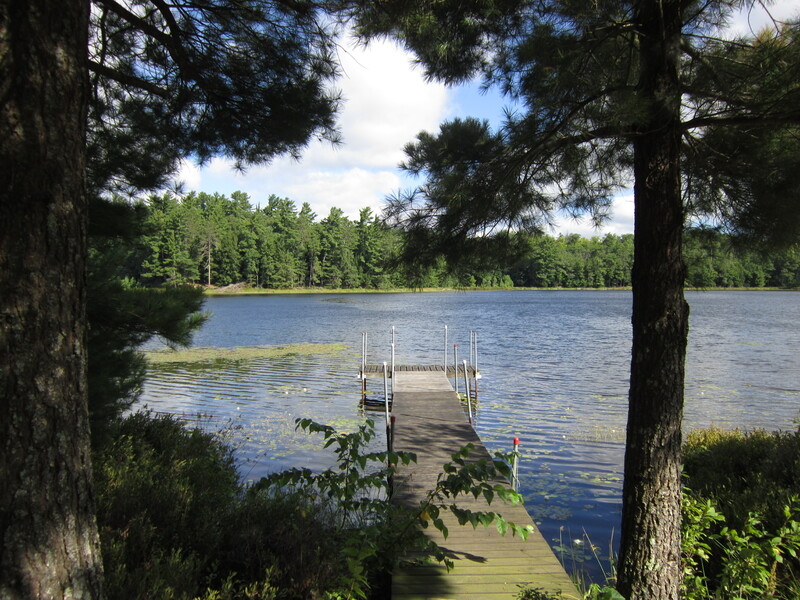 One such place happens to be my parents’ lake house in northern Wisconsin. We spent a glorious week eating, drinking, relaxing and working. Matt’s best friend also came along for part of the trip. I love having the chance to show off my favorite little northwoods town. I’m pretty sure he had a good time, I know I did! Here’s my top ten list from this trip. Enjoying morning coffee on my parents’ new deck. It’s amazing how adding three feet can make such a difference! Picking out a new kitchen countertop and backsplash for the cottage with my mom at Home Depot. Rolling out of bed early to take advantage of a morning kayak trip around our lake. Catching a snowshoe baseball game. Winning a raffle ticket prize at snowshoe baseball…a delightful banana boat from the Korner Drive. Watching Matt’s face brighten with glee when my dad’s new tractor arrived. A delicious dinner at Little Bohemia. Order the prime rib, you will not forget it! Hitting up our one of our favorites, Minocqua Brewery, for a sampler paddle of brews and appetizers. A few weeks ago I wanted to make a special dinner for Matt’s belated birthday. 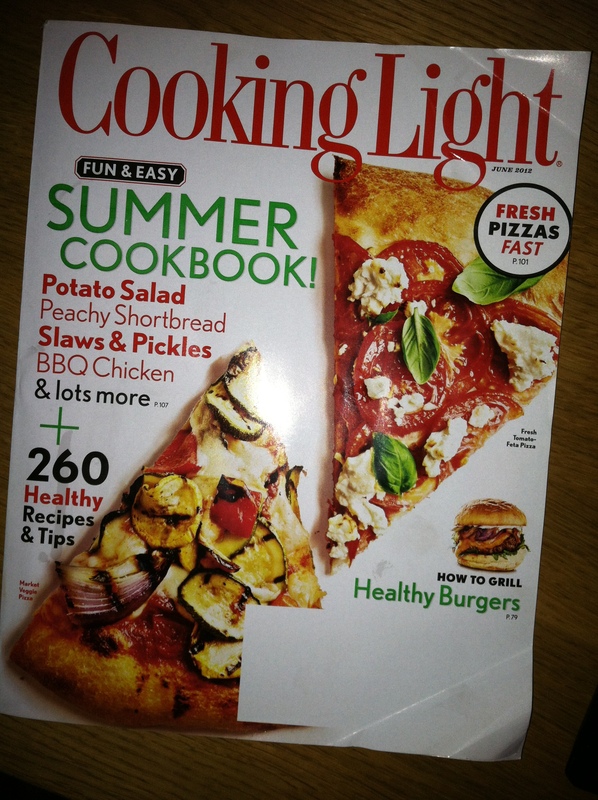 Knowing that he wouldn’t mind grilling, I went straight to the latest edition of Cooking Light. The July edition has a great meal plan for camping and one meal imparticular stood out. 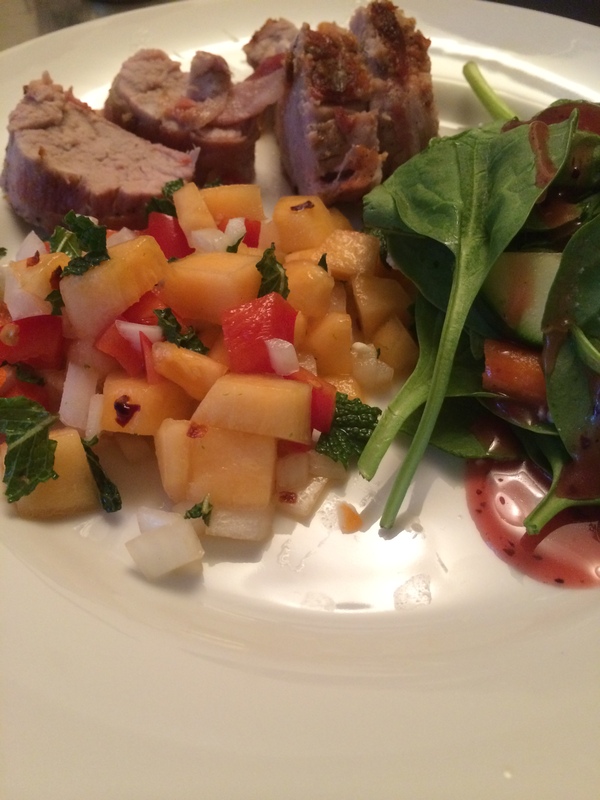 It was pancetta-wrapped pork tenderloin with cantaloupe-red pepper salsa. Sounds pretty tasty right? Well it totally was! My first step was the salsa. I wanted to make it ahead of time so the flavors could meld together. About one hour before we started grilling I was dicing up the cantaloupe and red pepper. Once the salsa was done it was time to prep the tenderloin. Our only recommendation was to sear the pancetta on the pork for a minute on each side before fully cooking the tenderloin. The meal was amazing. The pork stayed so tender and the pancetta crunched up nicely for a great mix of textures. The salsa was a fun twist on the normal pico de gallo and I loved the fresh fruit. Plus it looks so pretty. Steps – Preheat grill to medium-high heat. Make sure pork is dry by patting it with paper towels. season pork tenderloin lightly with salt and generously with pepper (or to your taste). 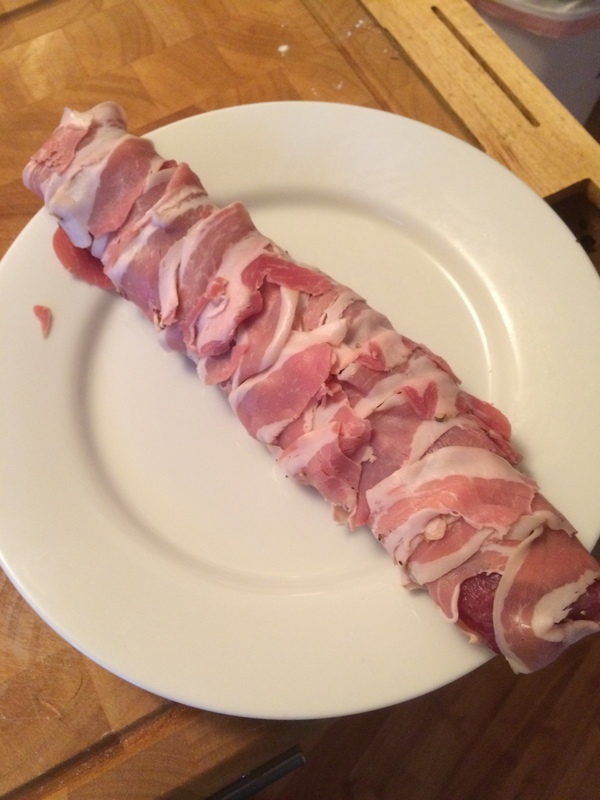 Then wrap the pancetta tightly, overlapping slightly. Steps – chop all fruits and vegetables accordingly and mix in a medium bowl. Be sure to mix well and the cover and chill for at least one hour before serving. 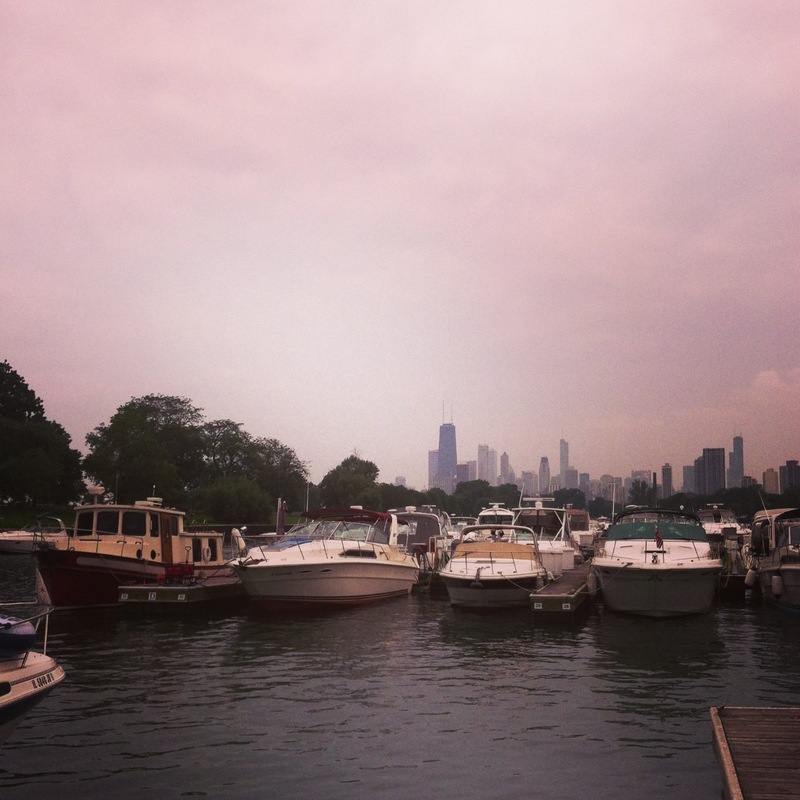 The best view of the city of Chicago is when you’re on a boat in Lake Michigan. Chicago has such a beautiful skyline and it’s pretty rare that you can see it from that angle unless you know someone with a boat. Luckily I do. And I’m even more lucky that they take me out on it pretty regularly! This weekend Matt and I spent a day down at Diversey Harbor with our friends Mia and Doug. We started off the afternoon grilling brats dockside, drinking beer and enjoying the view. Mia had cut up some watermelon and I brought some home made rice krispie treats for dessert. It was perfect. Oh, and let me tell you, some fabulous people watching too. Apparently we came on a calm day since most of their boat neighbors were still recovering from the 4th of July…worked out perfect for us! After lunch, we headed out on the lake. It was a little choppy but made for a fun boat ride up to Montrose beach. 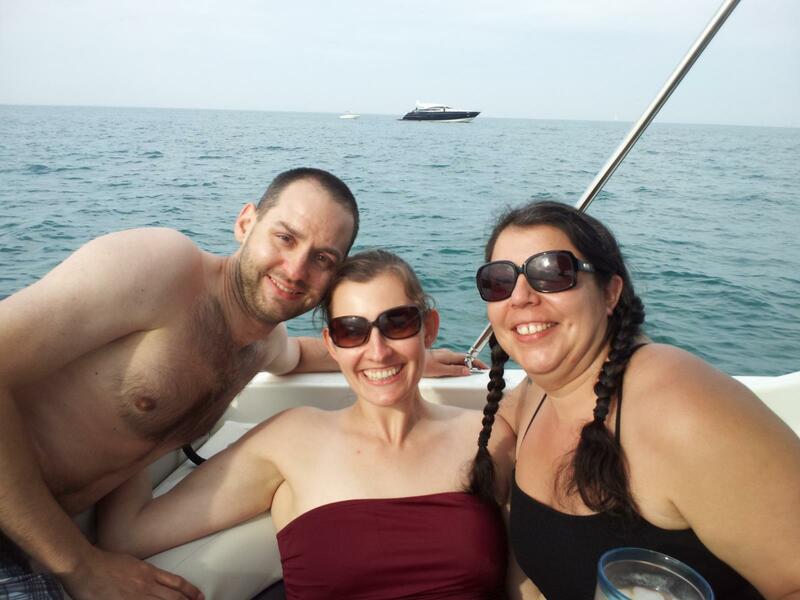 We anchored nearby to enjoy the techno “thuds” from the Wavefront Music Festival. Doug and Matt were brave and swam a few times. Mia and I however stayed on the boat. I need the water to be a over 65 if I’m going swimming otherwise I turn into a popsicle. We spent the rest of the afternoon talking, having random dance parties and ogling at other large boats wishing we had millions of dollars to spend. Time to buy a lotto ticket. Once dusk hit we headed back into the harbor. Mia and Doug convinced us we needed dinner so we followed them to an adorable sushi restaurant close to the harbor called Torajiro Sushi. We continued our dance party in the restaurant much to the owner’s delight. So much so we got a free order of rolls and a free round of saki. Yes, we brought our best moves and were rewarded. But seriously, the food was amazing and the owners were wonderful. Matt and I told Mia and Doug we have a new tradition whenever we go on the boat with them – the evening must conclude with sushi. Spring has sprung at last in Chicago. A few flowers are even starting to come up at my parents’ house! The warmer weather hints that summer is on its way. And summer is one of my favorite times in Chicago. There are so many different things to do outside! Playing, catching a Cubs game, eating, drinking, going boating, walking, trying out new breweries and wineries, touring, kayaking, riding a segway, you name it! It’s nice when you have options. This summer I’m looking forward to a few fun activities. Below are the current top three. Please note this may change in ranking over the summer. But be on the lookout for future posts about them! One would be going up to the Lake House in Wisconsin. Matt and I are planning on doing a few long weekend trips this year. But one will be coming soon because of our wedding. Why you might ask? Oh, well, we need to get our Paul Bunyan on and cut down a tree. Yep, we need a tree for the wedding. Intrigued? I’m not saying why so you’re just going to have to wait. And those that do know who may be reading this post – no spoiler alerts please! Two would be Ravinia. Currently it looks like we’re going to Alabama and the Under the Sun Tour featuring Vertical Horizon, Fastball, Smash Mouth, Gin Blossoms and Sugar Ray. On my maybe or “bubble list” is Tony Bennett, Journey and the CSO playing the score of Two Towers. Luckily I have until April 25th to decide! Be sure to check out the full lineup and find out if any of your favorites are playing this summer! Three is a new item this year, Beer under the Glass held at the Garfield Park Conservatory. You might remember Kelly’s blog post on the event from last year. This year a bunch of our friends are going – which will be a blast. Sampling local craft beer in a conservatory with my favorite people in the world sounds like a pretty stellar night to me. What are you looking forward to doing this summer? Do you have any favorite summer traditions? Summer is a great time to try out new recipes. This season and pretty much until fall, you can start to cook with a whole new arsenal of fresh ingredients. My personal favorite part about summer cooking is being able to buy local produce. Kelly and I both enjoy going to the local farmer’s market to pick out off the vine fruit and vegetables. The only hard part is deciding what to make. There are so many tasty options from sides, to salads, to desserts, to drinks, to main dishes… Luckily, I have a few willing guinea pigs who are up for trying new recipes. My first opportunity came this Sunday. Matt wanted to grill some ribs but needed a side. Armed with my recent edition of Cooking Light I was ready and willing. Thumbing through the “fun and easy” summer cookbook section I found the perfect option to accompany ribs – coleslaw. But this wasn’t your traditional creamy coleslaw, instead it was a tangy mustard vinegar based slaw. Have I peaked your interest? If that didn’t do it, I also found a recipe for piña coladas. What I love about Cooking Light is that all the recipes are ridiculously good and healthy for you. It’s always a win-win combo…even when you forget one or two ingredients at the grocery store. So usually I’m pretty good about making grocery lists. But somehow I missed the cilantro and cumin seeds for the Cabbage Slaw with Tangy Mustard Seed Dressing. Oops. Fortunately, I did have everything else to make the slaw and it still turned out really good! Next time I’ll just have to remember the cilantro and cumin. The piña coladas were probably my favorite part of the meal. It is likely due to the fact that I’m a goner as soon as I read anything with coconut in the ingredients. The recipe was easy to follow and, since there were just two of us, there were plenty of leftovers. Plus I didn’t feel that bad since the “makeover” drink recipe featured in Cooking List had almost 250 calories and 7 grams of saturated fat less than the “classic” version. Cheers to that! Stay tuned for future adventures in the kitchen combined with trips to the farmer’s market. Plus you might be in for special dual posts from Kelly and I regarding our adventures with our (Community Supported Agriculture) CSA and what dishes we decide to serve up! This weekend I helped to pull in my best friend’s parent’s dock. It’s a pretty significant event that marks the end of summer, much to my lament. So after we rolled up our jeans and put on sweatshirts and hoodies to combat the cold water, we got to work. Together we moved the three-section dock to its proper winter home next to the fence. Taking out the dock reminded me as summer closes, I thought I would check in with my summer to-do list. Attended a Cubs game – actually 2! Attending a Kane County Cougars game – summer of 2012! Not to brag, but I was able to do quite a few things this summer. Plus there’s still some time in the fall to knock out those remaining two items still possible. Maybe if you’re lucky I’ll even create a fall to-do list!